A motorcycle accident no matter how minor the accident is can lead to depression especially with the thoughts of repair costs, medical bills and the issue of getting adequate compensation comes up. 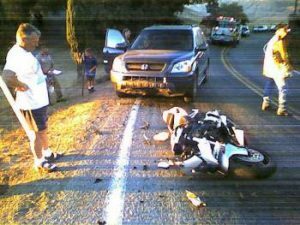 If you are in El Cajon and you are bothered about such or you in such a dilemma, you should turn to an experienced motorcycle accident attorney in El Cajon. You don’t deserve to be pushed over, contract the legal services of an accident lawyer in El Cajon to assist you with getting your full compensation. Contact us at Rawa Law Group if what you seek is the best legal representation in California. Our attorneys work relentlessly and tirelessly to see that you are awarded the maximum compensation available by law. Rawa Law Group has been aiding claimants in El Cajon get full compensation for over a decade now. Our motorcycle accident attorneys have a combined work experience of over 50 years and this wealth of experience is always put into action in the courtroom to get the maximum legal benefits applicable. With Rawa Law Group, you’ve got nothing to worry about. Not only are our services excellent, we absolutely do not get paid unless we win your case. That’s not all; we don’t collect any upfront fees too. If your motorcycle accident is still fresh and you are still recovering, we can come down to meet you either at the hospital or at your home. Why wait when you can schedule a free initial consultation with us? Reach out to us today via the details below.